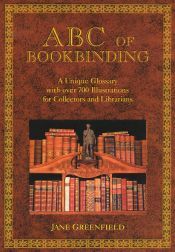 The vocabulary of designer bookbinding is extremely detailed and specific. I’ve been in the library and antiquarian book world long enough (don’t ask) to know quite a lot of book terms. All of them are useful in understanding and describing the structure and appearance of a book. Many are helpful in parsing a technical description of a designer binding. Tight joint? Kettle stitch? Palladium? Puckered? Maril? Cross-grained? Thanks to ABC, I’m getting a clue.